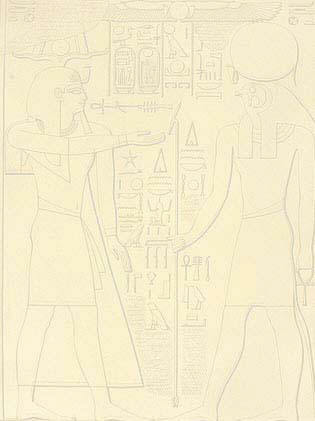 Weigall must have examined the alleged bands closely because he reported that they were inscribed and had cartouches cut out (JEA 8 , 196-197; LToA, 231, 242.) (This description, it must be noted, applies equally well to the coffin's gold foil bands of inscriptions.) Cyril Aldred (JEA 47 , 57, 58 and n. 5) stated that the mummy bands were supposedly sent to the Cairo Museum with the bones of the KV 55 mummy, and were subsequently stolen. Bell points out that Aldred's version is not exactly the same as that given by Arthur Weigall (see above) or Joseph Lindon Smith (TTAA, 66), where neither state that the gold mummy bands were placed in with the remains. Aldred related that G. E. Smith had told Warren R. Dawson that the bone box [i.e. the box containing the remains of the KV 55 mummy] had three or four engraved "gold bands" in it, which he stored in a drawer in his desk. He went on to report that these "gold bands" were stolen from his desk on the same day he had stored them there. Weigall (JEA 8 , 197) claimed to have seen the mummy bands in a workroom at the Cairo Museum and implied that they might still be in the Cairo Museum at the time of his writing (1922). Bell believes that Weigall and G. E. Smith were in reality taking about two entirely different sets of gold objects. She thinks G. E. Smith was probably referring to the thin gold foil bracelets found encircling the mummy's skeletal upper left arm and right wrist, which would probably have been packed up with the remains of the mummy for shipment to Cairo. 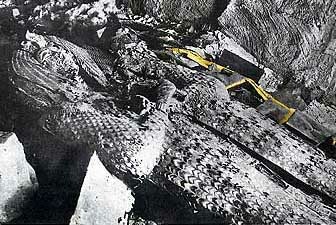 These bracelets (six in number, three on each arm) were described as being found on the mummy by Davis (ToQT, 9-10), Ayrton (PSBA 29 , 280) and J. L. Smith (TTAA, 63.) They are not listed in Daressy's catalogue of KV 55 objects. These were probably the "gold bands" which G. E. Smith discovered had been stolen from his desk drawer. 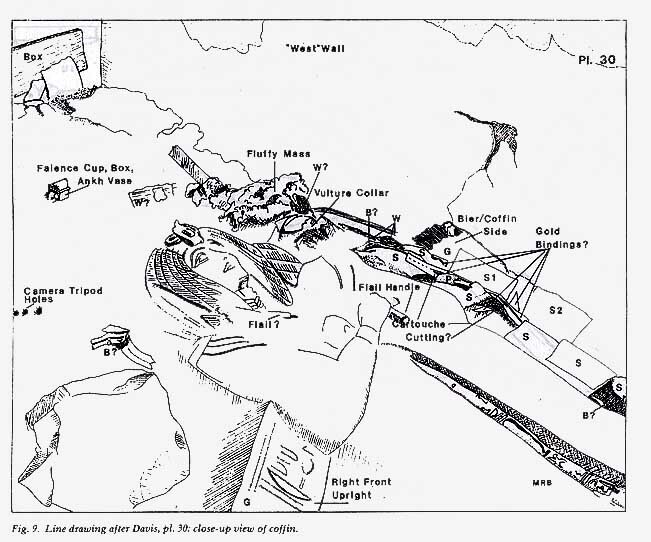 This scenario strongly suggests that Weigall's mummy bands were not the objects which G. E. Smith found with the remains and reported stolen from his desk. If the mummy bands were shipped with the coffin elements, they may have remained in the Cairo Museum as late as November, 1927, after which some of the basin elements were taken (see above for explanation of. the 1927 dating for this event.) G. E. Smith's casual mention of the mummy bands in his 1912 work, The Royal Mummies (Cairo, 1912, p. 51) and also in his 1924 book, Egyptian Mummies (Kegan Paul International, Ltd., 1991 reprint) also seems to support Bell's theory. Smith often provided detailed descriptions of any objects which he found with a mummy, but when he described the remains of the KV 55 mummy (whom he identified as Akhenaten), he says merely that it was found "encircled by bands of gold," and gives no further details. He also notes Arthur Weigall's paper (JEA 8 , 193ff.) as the source for his knowledge of the bands. If G. E. Smith had seen and handled the mummy bands himself, surely he would have described them thoroughly (and perhaps commented on their theft) in his published works. Furthermore, he would have had no need to use Weigall's article as a source if he had actually seen the mummy bands for himself along with the remains of the mummy. George Johnson reported that the KV 55 mummy bands resurfaced a few years ago on the antiquities market (KMT [9: 1], 66, n. 3), but no further news about them is available at this time. However, if the bands were taken from the Cairo Museum along with the coffin basin elements, there may be a chance that they, too, will re-emerge from curatorial obscurity when the State Museum of Egyptian Art in Munich reveals all the details about the KV 55 coffin basin elements now in their possession. Addendum: Since my writing of this page, Egyptologist Frederico Rocchi visited Munich's State Museum of Egyptian Art and saw their exhibit of KV 55 objects (which were displayed from Oct. 17'th, 2001 through January 13, 2002.) In his EEF Report, Rocchi stated: "On the third wall were displayed six golden bands found together with the pieces of the KV55 trough, but not belonging to the trough; they probably belonged to the Cairo lid of the coffin." These golden bands were most probably the long-missing "mummy bands" originally reported by Weigall. Rocchi's statement tends to confirm the theory that these bands were originally elements from the coffin lid, and not (as Weigall and others have assumed) part of the mummy's wrappings.